With a week off of work I am going to try and hit four to five rivers in about 9 days. 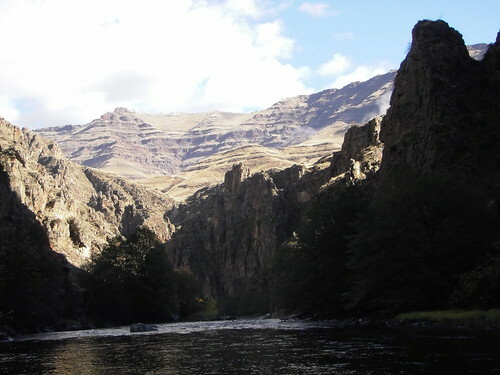 The first river of the week is the Imnaha River. I know. 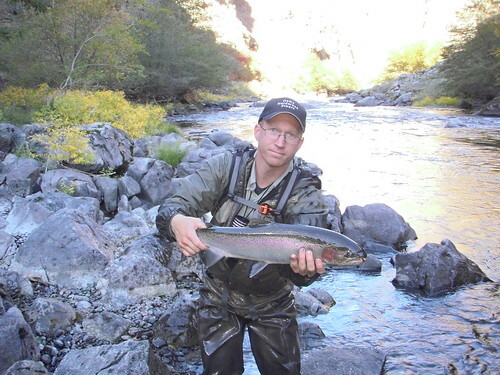 I fish the Imnaha a lot for steelhead. But anytime I get to enjoy on the Imnaha is time well spent. I really like the Imnaha; the big deep canyon with vertical rock walls, the rough Doug Bar Road with the abundant stands of bunch grass interspersed with rock cliffs jutting out that might make a good staircase for a giant. And best of all, I like the rough and tumble nature of the lower Imnaha. Although there are many pools and runs, there is a great deal of good pocket water among boulder runs. I enjoy fishing that water more for some reason. Anytime you hook a steelhead, there is a great deal of anticipation and uncertainty whether you will land it or not. But on the Imnaha, it seems even more uncertain. At any time the steelhead can make a fast run downstream through rapids with boulders the size of a bus in your way. You not only have to contend with rapidly following the fish downstream through rocks that are difficult to wade at a walk, but now you are doing it as fast as you can while trying not too let the fish wrap your line around a boulder. Ah . . . steelhead fishing at its best. This past weekend I hooked a steelhead while standing on a large boulder the size of a medium car when the fish decided to take me downstream to the next pool. Now you might ask why I was standing on a large boulder since that is not a good spot to battle and land a large fish. Well the answer is good. I had fished this particular spot thoroughly dozens of times and never caught a steelhead out of it. I knew there had to be steelhead in it. It was one of the best spots for steelhead in a half mile section of river. So I decided to fish the pool from a different spot. In the past I had always went to the bottom of the pool and methodically worked my flies through with no fish for my efforts. Since I thought there should be fish in there, I decided it was time I changed how I fished the hole and that is why I was on the big rock at the head of the hole. I was paid off with a fish on the first cast for changing how I fished this previously unsuccessful water. Now the only problem was how to land the fish. Well there was a nice log resting on top of the rock that angled down to another rock that would be an easy hop down to the bank. So with steelhead on, I wobbled my way down the piece of wood to the bank where I eventually landed the fish. My wife was able to join me on this trip as well. In fact I fished it during the weekend so she could join me. She had not yet hooked a steelhead and she has been talking about wanting to catch one for some time and the first pool we fished on Saturday morning she hooked one straight away. She seemed a little lost on what to do after she hooked it, so I tried to coach her on getting all that slack line back on the reel so she could fight the fish from the reel. Then as the steelhead was making runs up and down the pool, I tried to tell her to let it run, but not too much. Just keep pressure on the fish to wear it down a little. It was all a little hectic, but she did quite well until the line broke and the fish swam away. Dang it! That was about all the action for most of the morning. My wife has not steelhead fished much and she began to comment that I wasn’t going to let her come with me anymore since I hadn’t caught a steelhead yet. “Don’t worry.” I told her, “This is steelhead fishing. You might not catch anything all morning and then be hooking them non stop all afternoon.” I was hoping anyway. The afternoons have often been the best steelhead fishing for me anyway, especially when it starts to get cold at night. Although I didn’t land steelhead all afternoon, I did get quite a few landed in the afternoon and lost several as well. Late that afternoon my wife hooked her second steelhead for the day as well. This time she did a very good job fighting it. She got her slack line in right away and fought him off the reel, keeping pressure on the fish, but not trying to horse him in. But the fish still got away. That is steelhead fishing for you. Sunday on the Imnaha started out a bit slow again other than a 20”+ bull trout that tried to annihilate my streamer. Sunday was a pretty good day of fishing for me. 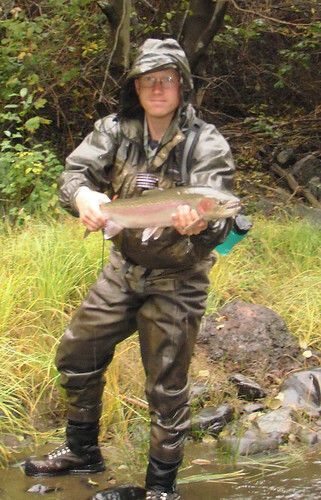 I landed 6 steelhead that day. I was trying to be nice by letting my wife fish through the spots first, but she began to get a little grumpy with me when I kept catching steelhead right behind her after she had fished the water through. I think she even began to cuss at me, although I couldn’t hear exactly what she was saying. It was quite a good weekend of steelhead fishing, even if I got cussed at a little by my wife. 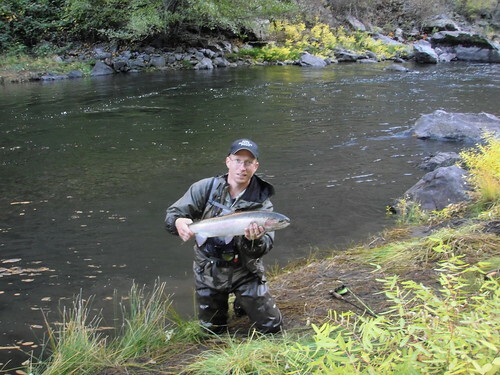 This entry was posted in Imnaha River, Steelhead Marathon 2010. Bookmark the permalink.